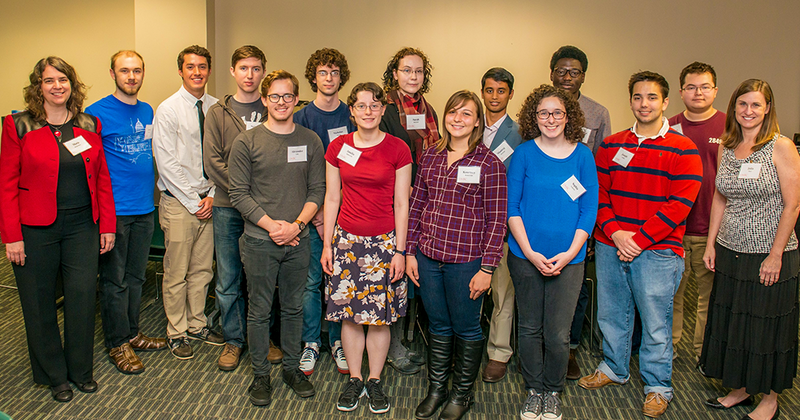 Congratulations to the 49 undergraduate majors from our computer engineering and computer science programs who are presenting their research at the 23nd Annual Undergraduate Research and Creative Achievement Day on Wednesday, 24 April 2019. 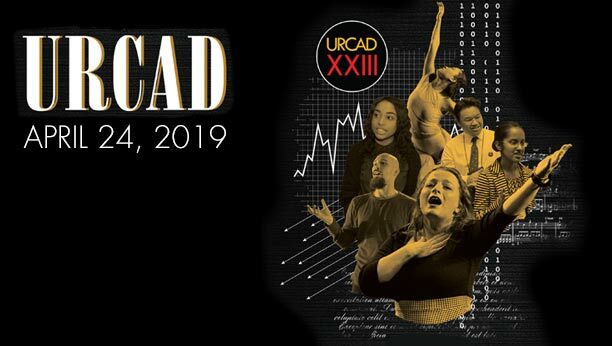 UC Ballroom | 1 – 2:30 p.m.
UC Ballroom | 10 – 11:30 a.m.
UC 312 | 3:45 – 4 p.m.
UC 312 | 4 – 4:15 p.m.
UMBC students have rewritten the record books in 2018. With graduation this week, and our soon-to-be new Retriever alumni preparing for graduate school, careers, and research around the world, we reflect on all they have achieved. Here is a CSEE student profile from the class of 2018. If it weren’t for the incredible mentors, teachers, and students at this school, I would not be the security researcher and professional that I am today. When Bryan Vanek transferred to UMBC from Frederick Community College, he focused on building connections with classmates and professors, which proved incredibly valuable as he developed a passion for computer science and cybersecurity, and sought out new opportunities to grow. 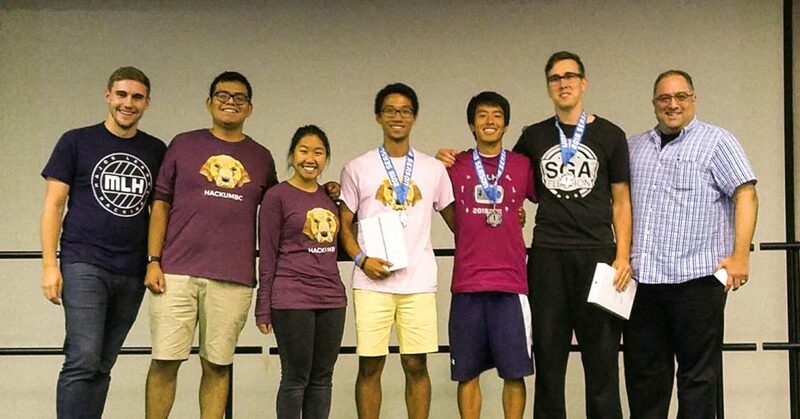 Vanek became president of UMBC’s Cyber Dawgs team, which took first place at the 2017 National Collegiate Cyber Defense Competition. Following that major victory, he has continued to serve as Cyber Dawgs president, while also participating in other cybersecurity competitions, including the Wargames capture the flag event at the international DEFCON conference, where he placed 42nd overall. The Center for Women in Technology provided mentorship and support to Vanek, who is a Transfer Scholar in Information Technology and Engineering (T-SITE) Scholar. He says that the Cyber Dawgs team and CWIT program have helped him to develop skills necessary for success in a computer science career. Vanek gives back by serving as a mentor in cybersecurity at Exerceo, a nonprofit which provides skill development opportunities to high school students, college students, and young adults. Vanek also completed two internships at the U.S. Department of Defense (DoD) while at UMBC. These positions led to an exciting job offer for him, as a member of the Computer Network Operations Development Program at the DoD. Vanek credits “professors that continually showed a vested and fervent interest in my success” and UMBC’s connections with a robust networks of employers with empowering him to plan and pursue a cybersecurity career. Adapted from a UMBC News article by Megan Hanks. Portrait by Marlayna Demond ’11 for UMBC. UMBC provides extensive opportunities and support for students to get engaged and involved in service beginning in their freshman year. The UMBC Shriver Center has been incredibly supportive of every service endeavor I wanted to do. Max Poole wants to live in a society where everyone can access an education, is informed, is open to hearing new ideas, and is willing to work together to achieve great things. With this ideal in mind, he is completing three majors in three different colleges, which has enabled him to explore problems from a range of angles. He has also pursued collaborative service-learning opportunities through the Shriver Center since his freshman year, with a focus on promoting college with middle school students and boosting access to computer science education. Poole has been recognized for his commitment to service with the 2016 Newman Civic Fellowship. He is also a Sondheim Public Affairs Scholar and a member of the Honors College, with stellar academic achievements that have garnered him recognition through the national honor societies Pi Mu Epsilon and Phi Beta Kappa. Beyond UMBC, Poole even pursued service opportunities while a summer intern at eBay. He looks forward to resuming those projects when he begins a full-time position with the company after graduation. UMBC’s values and commitments to diversity, education, and social justice allowed me to grow into the interdisciplinary thinker, problem-solver, and leader I am today. Joshua Massey, president of UMBC’s Student Government Association (SGA), has been recognized across campus and by university partners for his leadership, his enthusiasm for community connections, and his passion for technology in education. Massey was one of the first recipients of the Northrop Grumman Scholarship for increasing the number of undergraduate and graduate students in the United States pursuing degrees in computer engineering and electrical engineering. Through the program, Massey had the opportunity to connect with industry leaders and attend mentoring events. Massey is a member of the Meyerhoff Scholars Program, and also received the Meyerhoff National Security Administration Scholarship, which enabled him to connect with industry mentors regularly and to participate in monthly seminars. In addition to receiving mentorship from faculty and professionals in technical fields, Massey also provided support to others as a peer mentor and a teaching fellow for a course in computational thinking and design. On campus, Massey is known for his enthusiasm for the UMBC community. He served as a “Woolie”—a Welcome Week student leader—in addition to serving as SGA senator and chief of staff, before being elected SGA president. One of Massey’s most memorable SGA moments was the 2017 SGA summer retreat, which he attended as incoming president. “At our annual summer retreat, new and returning students involved in SGA learn about the history and values of UMBC and the SGA, work cooperatively on plans for an upcoming year of campus change, and build relationships with one another as we continually create the story of SGA at UMBC,” Massey explains. He enjoyed facilitating sessions on the important role of students in UMBC governance. Katherine Dillon came to UMBC with interest, but not much experience, in computer science, but through the Center for Women in Technology (CWIT) was able to rapidly grow her knowledge of the field. Before long, she was conducting computer science research, taking graduate-level courses in artificial intelligence and machine learning, serving as a teaching assistant in computer science and interactive media, and volunteering through outreach opportunities, to inspire and support future computing students. Dillon says the support she received from the faculty and staff at UMBC, particularly in CWIT and the Honors College, has been instrumental in enabling her to achieve her goals and continuously set the bar higher for what she would achieve next. Dillon conducted data visualization research under Penny Rheingans, professor of computer science and director of CWIT, and attended the Grace Hopper Celebration of Women in Computing as an Anita Borg Scholar. After the Grace Hopper Celebration, Dillon was offered an internship opportunity at Google in Boston. The following summer she completed another Google internship, this time in Germany. After graduation, Dillon will work as a software engineer at Google in San Francisco, while also completing her master’s degree in computer science online through UMBC. UMBC is recruiting undergraduate students for the third cohort for its Grand Challenge Scholars Program (GCSP). UMBC’s GCSP is an exciting opportunity that is open to students from all majors who are interested in exploring interdisciplinary approaches to making the world a better place. Come to the Grand Challenges Symposium from 6:00-8:00pm on Monday, April 2 in UC 310 to learn more about the GCSP, meet the current scholars, and enjoy light refreshments. The Grand Challenges are 14 problems in the areas of sustainability, health, infrastructure, and the joy of living that will require interdisciplinary teams and sustained years of effort to solve. The GCSP brings together a diverse cohort of undergraduates from all majors to work towards solutions for these problems. GC Scholars develop broad skills by completing experiences in five program areas: research, interdisciplinarity, entrepreneurship, global perspectives and service. Scholars will receive formal designation as an NAE Grand Challenge Scholar at graduation. We especially encourage sophomores to apply but students who are earlier or later in their studies are also welcome to apply as long as they are able to complete the requirements. In addition to the five program experiences, students must complete three one-credit GCSP seminars, and are expected to participate in GC-related activities on and off campus. For more information about the program, visit the GCSP site. To apply, students should submit online an unofficial transcript, short essay answers, two names of references, and optionally a short letter of support. The deadline is April 15 but we will also consider applications received after the deadline on a rolling basis. Now in its second year, the HackAE event brings America East conference students together to build software and hardware projects that address the real-world challenges facing our neighborhoods, cities, states, and country, with a specific emphasis on issues pertaining to cybersecurity, education, environmental sustainability, and health and wellness. This was the first time UMBC participated. Watson and Turyahikayo were asked to create an opioid prevention platform specifically for teens. The app they developed pairs teens in need with teens who wish to help others facing opioid challenges. The opioid epidemic facing the country affects every community and demographic; however, Turyahikayo said that she was surprised to learn how widely teenagers are affected by the crisis. “Unfortunately, many of the resources we found for opioid abuse didn’t target teens very well and were not reaching those who needed help,” she explained, which led her and Watson to create an app that teens could access on their mobile phones. While Turyahikayo and Watson were recognized for the app they created, they faced some challenges during the hackathon. They did not have prior experience developing Android apps, but used trial and error to figure out how the Android Studio program would allow them to develop an app during the hackathon. Turyahikayo is planning to continue to develop the app over winter break. Not only does the app connect teens in need of help, it also offers a range of helpful resources. “It can help loved ones to recognize the signs of opioid abuse and help those who don’t realize they have a problem,” Turyahikayo explains. Adapted from a UMBC News story written by Megan Hanks. Banner image: Gabrielle Watson, right, and Agatha Turyahikayo at HackAE. Photo courtesy of Agatha Turyahikayo. Want to learn about blockchain or machine learning? Like to get hands-on experience building software for IoT? Participate in DevFestMD ’17 and do all of that and more! 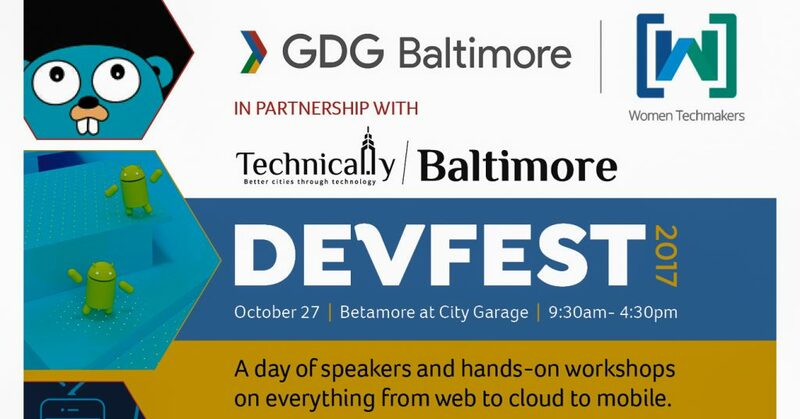 DevFestMD is a day-long tech event filled with talks and hands-on workshops. So whether you’re thinking about joining the tech community or a seasoned software engineer, they have something for you. Early Bird tickets are only $10 and includes breakfast and lunch. 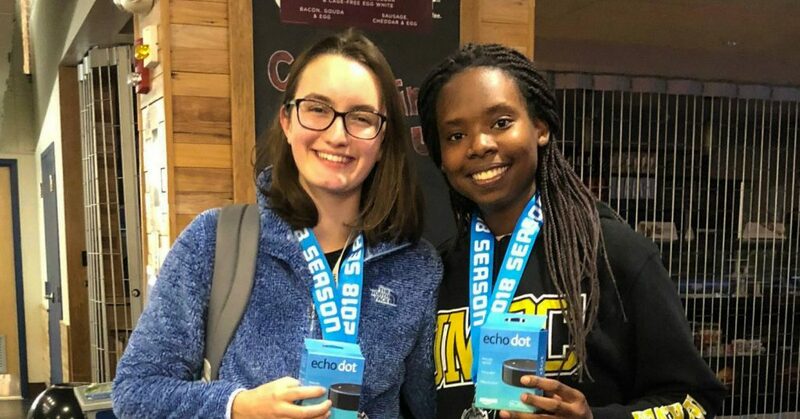 HackUMBC is a 24-hour tech innovation marathon where students across the East Coast collaborate on new ideas to build mobile, web and hardware projects. 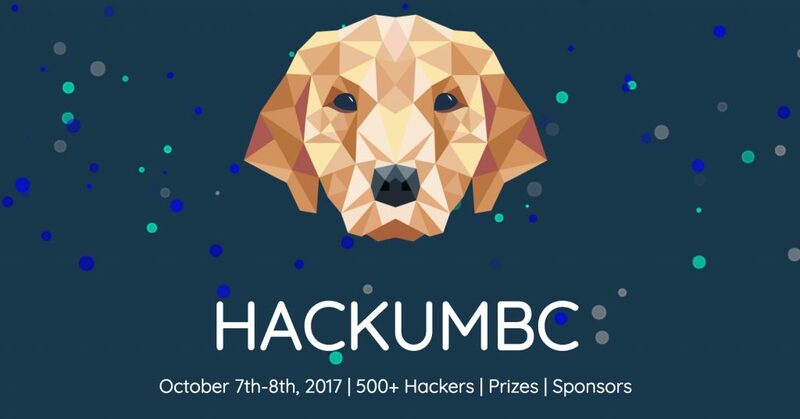 HackUMBC invites diverse groups of students, undergraduate, graduate and high school students over 18, to enjoy a weekend of hacking, workshops, tech talks, networking, and other fun activities. At the end of 24 hours, projects are presented and judged for different prize categories from sponsors and other organizations. What if I don’t have a team or an idea? : No problem! You can find a team once you arrive. Most hackers arrive without a team. You will often find inspiration for ideas at the hackathon. What if I don’t code? : This is the perfect opportunity to learn something new! There will be workshops geared towards beginners and mentors to help you throughout the event. What can I build? : Anything! Web, mobile, desktop, and hardware projects are all welcome. Projects will be judged based on creativity, technical difficulty, polish, and usefulness. Will there be hardware? HackUMBC has partnered with MLH to provide hardware hacking resources to all hackers. Check out the full list of hardware. How much does it cost? HackUMBC is free! Food, beverages, swag, workspaces, and sleeping areas will be provided. You just have to travel to the event and we will take care of the rest! The event starts in Meyerhoff 030 at 10:00am on Saturday, October 7 and ends at 3:30pm on Sunday, October 8. Visit the HackUMBC site for complete details and to register.